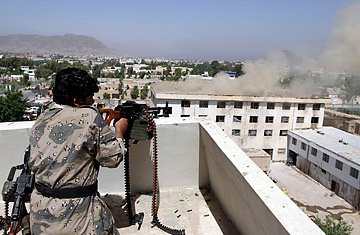 An Afghan border-police officer fires on Taliban fighters who are hidden in the rooftop of the Traffic Department building, from where the smoke is rising, in Kandahar on May 8, 2011. As the sun rose, the men from the raiding party chanted verses from the Koran, spread their checkered scarves on the dirt and prayed for Osama bin Laden's swift passage to paradise. It was a ritual they'd performed a hundred times for their fallen comrades. But there were no outbursts of grief or pledges of vengeance. Bin Laden had been a good Muslim, said the small, wiry Taliban judge leading the ritual. Bin Laden had surrendered a life of luxury for one of hardship, and his "death on the battlefield" was befitting. Beyond that, as far as the Taliban are concerned, "his death had no impact," said the judge, who goes by the nom de guerre Khanjari (and whose identity was confirmed by a member of Afghanistan's security service). "Every member of my group is as brave as Osama," Khanjari continued. "The only difference is he had more money ... My friends mean more to me than him. Any one of us would take a bullet for each other." For the Taliban, bin Laden's death has been far less important than some in the West may have hoped. As a fighting season expected to be the bloodiest in a decade gets under way across Afghanistan, a common misconception in Western commentary is to attribute the escalation to a desire to avenge bin Laden. On Monday, NATO's deputy chief of communication in Kabul, Brigadier General Christine Whitecross, suggested that "al-Qaeda and Taliban will try to take revenge by intensifying their attacks, but the Afghan and NATO-led international troops will not let them to succeed." Just last month, however, NATO was claiming that al-Qaeda had fewer than 100 operatives in Afghanistan, and that they were mainly hunkered up in the northeastern corner of the country. Now, though, linking violence to al-Qaeda is a ploy to cast the long-expected spike in violence as unconnected with the root causes of the insurgency, explains one Western diplomat. "People are asking, What ... are we doing in Afghanistan? We killed bin Laden  wasn't that the whole point? So this might be a way of thinking we'd better quickly tie what's left of al-Qaeda to what's going on in Afghanistan as cover so we can stick around till 2014. I wish someone would call them on this because it's ... bull----." President Hamid Karzai is also in on the game, claiming that the synchronized attacks that brought the city of Kandahar to a standstill last weekend were the work of al-Qaeda, although it was patently obvious that it had been a Taliban operation long in the making. Blaming al-Qaeda was a way of deflecting blame from the Afghan government and its security forces, which are still reeling from a mass jailbreak that saw nearly 500 insurgents escape. "It's really embarrassing," says the Western diplomat, comparing it with the 1968 Tet offensive, which delivered a decisive propaganda victory to the Vietcong. "It shows [the Afghan National Security Forces] can't handle it, they can't stop 60 people from infiltrating with heavy arms, PKMs [machine guns], RPGs [rocket-propelled grenades]. So it's really bad optically." All the more so given that the cornerstone of NATO's exit strategy is handing control of Afghanistan's towns and villages to the ANSF, starting in July. The prevailing view among analysts and diplomats is that, at the highest levels, the Taliban have in fact almost certainly welcomed bin Laden's death. Michael Semple, a veteran Afghanistan hand and leading proponent of a political settlement with the Taliban, says many of the movement's leaders bitterly resented bin Laden for charming Mullah Mohammad Omar into granting him sanctuary, persuading the unworldly cleric that the Americans had no stomach for a fight  and as a result, losing their grip on Afghanistan when al-Qaeda provoked a U.S. invasion. "They're basically saying good riddance," Semple says. "They couldn't be seen to hand him over themselves, and he certainly didn't rely on them for his security, but now they say ... 'He's out of the way, let's see what happens.'" That doesn't mean the Taliban is about to quit the fight, of course. Tuesday saw around 200 insurgents storm police checkpoints in the remote mountain province of Nuristan  the second large-scale attack in four days. In eastern Afghanistan, an improvised explosive device just claimed the 167th coalition casualty of the year. Five people were killed and a dozen wounded when a bomber rammed his motorbike into the gate of a government building on Monday. Militarily, the Taliban's strategy is still a ride-out, a "Let's carry on doing what we can until the Americans get tired and go home," in Semple's words. But the ability of the U.S. to locate and strike bin Laden will also have the militants anxious. "You want to get my full details? I'll end up like Osama bin Laden," laughed Khanjari when TIME asked for his real name. They're also mistrustful of Pakistan, which affords them safe haven but has been happy to sell out Taliban leaders in the past. With Pakistan under enormous pressure from Washington, militants fear that may happen again. "Mullah Baradar lived in the same madrasah in Karachi for 10 years," said Khanjari, referring to the former Taliban No. 2 who was arrested by Pakistan's spy agency in early 2010. "When the Pakistanis feel a threat, they'll hand over some high-ranking Taliban." Still, Semple believes that because bin Laden is no longer a stumbling block, the U.S. should negotiate directly with the Taliban leadership in Pakistan. "Grasp the nettle," he says. "After years of pushing Pakistan to tolerate or conduct security raids, it's time to push the Pakistanis for something they themselves have been recommending  the political engagement." Finding a mutually acceptable settlement will still be tough, but the Abbottabad raid just provided a fresh place to start. See TIME's complete archive of the bin Laden coverage.